Google “the decline of America” and you’ll get roughly 61.8 million results in 33 seconds. There’s George Will bloviating about how LBJ’s Great Society was the beginning of the end. There’s hand wringing about foreign policy and “America’s bluff… being called.” Our healthcare and education systems, we’re earnestly told, resemble those of a “second-rate nation.” But perhaps the surest sign of our decline is the state of our fried chicken. Once upon a time, not so long ago, Southern fried chicken and Buffalo wings were the international hallmark of fried-chicken excellence. Once called “ambrosia, manna from heaven, caviar for the common man” by Chris Wadsworth of Gannett News Service, our fried chicken was distinctive, delicious and huge. Kentucky Fried Chicken (the name has since been formally changed to “KFC”) used it to become the world’s second largest restaurant chain, with 18,875 outlets in 118 countries and territories as of December 2013. That was then. This is now. Perhaps those “KFC” initials should be reserved for the world’s true, best fried chicken: Korean fried chicken. The best (and perhaps only) place to get it in San Diego is at Gala Chicken inside Zion Market in Kearny Mesa (7655 Clairemont Mesa Blvd.). The hallmark of Korean fried chicken is on display in the Gala Crispy offering: a thin and very crunchy—almost crackly—clean, non-greasy skin. Inside, the chicken is moist and intensely savory. With no sauce and a look that vaguely resembles a cross between the Colonel’s “original” and “extra crispy” options, Gala Crispy seems familiar. But Gala doesn’t serve fast food. The chicken is dropped to order and, consequently, there’s a 15-minute (more like 20) wait for your food. It is worth it. The cooking differs from the Southern version in two important ways. First, it’s double fried, with the chicken removed from the deep fryer (and vigorously shaken) part way through the process. This allows it to cool slightly and the oil in the fryer to heat back up, thus helping crisp the skin when the chicken goes back in. The other major difference is the batter. For one thing, unlike with American-style fried chicken, the batter isn’t seasoned before cooking; it’s seasoned after. And it includes both cornstarch and baking powder to yield a thinner, crunchier and less-greasy skin. Gala also offers Spicy and Sweet Soy options. The spicy is particularly good, if not particularly spicy. What heat there is in the spicy comes from gochujang, the ubiquitous, mildly spicy Korean chile paste. The sauce hits notes of acid (rice vinegar), sweetness and a rich layer of garlic. The chicken is tossed in the sauce immediately out of the fryer. It isn’t a clean and neat eating experience, but it is a very enjoyable one. 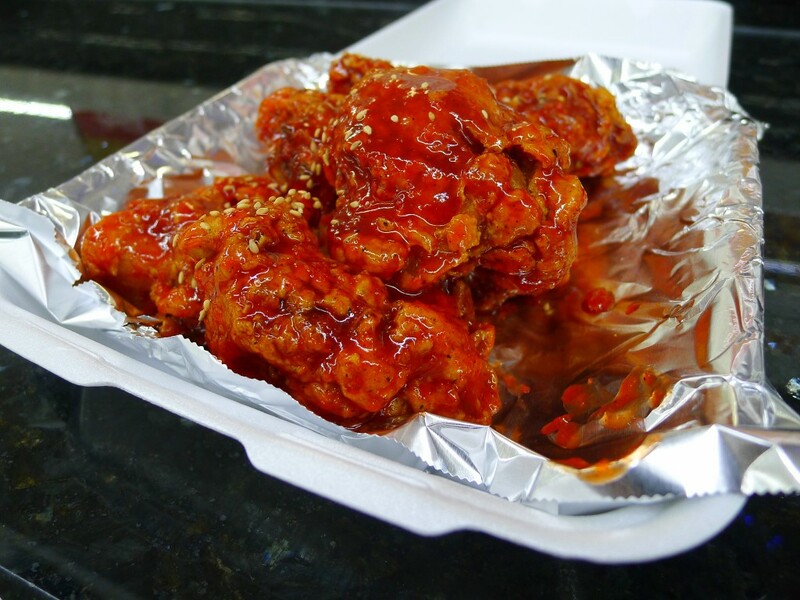 If Gala Crispy is Korea’s answer to the Colonel, Gala Spicy is its answer to Buffalo wings. They’re very good answers, indeed. Whether America’s declining is in the eye of the beholder. But the Korean Fried Chicken at Gala is certainly far better than the Kentucky Fried stuff—now or then.